Mission on Mission has redefined my Fridays. Three months ago I would look forward to Friday because it meant that I could go home, throw on T-shirt, a pair of jeans and flip flops and shed my corporate uniform of shirt and tie for at least a couple of days. Friday signaled downtime—relaxing at home, watching a couple movies or maybe a manageable mini adventure like a mountain bike ride. In short, Friday was my weekly threshold to a lazier life—it was my “off” switch. Now, as Friday approaches I get a sense of nervous anticipation, excitement and a little anxiety as the next leg of my journey awaits. Come Friday at 6pm, I usually have no idea what bar I’ll be visiting next, who I’ll encounter, what the experience will be like or if I’ll be welcomed into this new community (or at a minimum blend in). With Mission on Mission, my Fridays are now an exit strategy from my safe and comfortable little weekend box, forcing me to engage with people and places that I would not otherwise encounter. And, I have found that it has become even more than that… it is an opportunity to think critically about my interaction with the “local” – the local as a place, a community and as an individual (a “regular”). As my Fridays have changed thanks to this new adventure, so too have my weekends. Mission on Mission has forced me to separate my work life and my real life—and I find that I am taking less work home with me on the weekends. And while I am the king of procrastination when it comes to this blog, I somehow still manage to get it done. Writing is far from easy for me and there is great satisfaction in clicking the “publish” button on my posts. Until now I have not done much introspective rambling about Mission on Mission—and I promise that it won’t be a regular occurrence—but I think it’s important that I put this Mission into a larger context. Even though these first few bars have only been a mile from my house, crossing that dark threshold every Friday at 6pm is like getting off a plane in a foreign country without a place to stay, alone, and without a safety net. This experience of landing in a new territory, surviving the experience and coming away with a story to tell is both exciting and rewarding. In general, I’m not that big on chronicling my experiences or sharing them to an audience of strangers, but its all part of the journey and I’m glad I’ve started it. Ok, enough introspection, let’s get on with the next bar… I can’t tell you the size of the smile on my face as I passed Lucita's Niteclub and saw that my next stop on the journey was the Knockout. 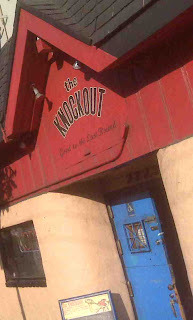 I’ve been to the Knockout once before on a Saturday afternoon a couple months back. My only recollection of the place was having too many beers, playing a lot of pool and then, as day turned into night, someone offering me a warm, fresh donut. At the time, I had no idea what to make of it but I welcomed the nourishment and washed it down with a beer –delicious, huh? About the same time I finished my donut dinner, a band called the Donuts Disco (classic disco, mutant disco, italo, cosmic, dutch electro old school hip hop and house) took the stage. This time I made my way through the Knockout’s dark doorway wondered how my evening would compare to last time. And, well, it ended up about the same. The Knockout has been open for 3 years and the bartender for the evening, Molly, has been working there since the beginning. I was able to join a conversation with her, Elam and Emma –who were the musical entertainment for later that evening. I’ve gotten pretty good at joining conversations and starting my own so this trip down Mission Street is paying dividends on improving my social skills. Chatting with Elam, originally from Israel, and Emma, from LA, I learned about their music, their backgrounds and how they approach their creative process. I can only imagine what it takes for them to stand in a spotlight in front of an audience, and sing—it is amazing to me and I admire their confidence. Suddenly, clicking the “post” button for Mission on Mission didn’t seem like such a big deal. Along with the interesting conversation I also shared a drink and shots of Ouzo (Molly’s treat) 3 times over, with the group. Molly prefers Raki, a Turkish drink, but the Ouzo was definitely enough to get me going. I managed to stay until about 9pm which wasn’t long enough to see either Emma or Elam perform. (sorry, next time guys!) But I hope the Ouzo helped ease their nerves as they took the stage. 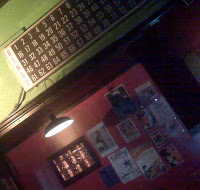 Decorated with old album covers, brightly colored cartoon posters and band flyers and with a photo booth to the side of the “dance floor”, the Knockout may be dark but it offers a solid positive vibe. Sitting across from Molly, the tattooed clientele and the out of town musicians I felt completely at home in this punk dive bar. Stumbling out of the Knockout into the chilly San Francisco night I made my way up the block hoping that some Silver Pad Thai with Shrimp would calm the 3 shots of Ouzo rattling around in my brain.